12" Electric Surface Grinder with quick change multi-accessory 12" disc . Rental fee does not include accessory sets that must be rented or purchased separately. Use Diam-A-Tach diamond segement set for smoothing or leveling concrete flatwork, raised edges on sidewalks or slabs. Use BeamScarifier set for removing fully cured carpet and tile adhesive, thick build-ups of greases, paints, oils, vegetable poweders and some resins from floors. Also for medium duty asphalt and concrete scafifying and descaling steel decks. Use Scrape-R-Tach set to remove many urethanes, epoxies, paints, mastics and other similar material accumulations from concrete floor surfaces. Use Pro Polish Kit for high quality polished concrete surfaces. Use Grinding stones for general grinding, removing trowel marks, rough uneven surfaces and polishing on concrete, terrazzo and other stone surfaces. 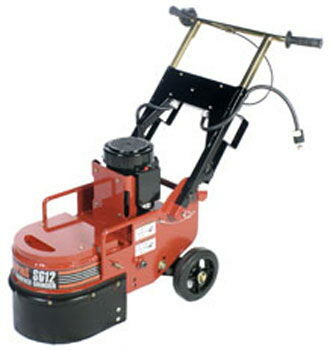 * Please call us for any questions on our concrete grinder 12 inch elec 115v/1.5 hp rentals in Portland OR, Gresham OR, Milwaukee OR, and surrounding metro area.